Opening times Mon–Tue 9am–6pm; Wed–Sat 9am–9pm. Closed Sun. Listed in the Ayrshire Larder – order a print copy (free + p&p). 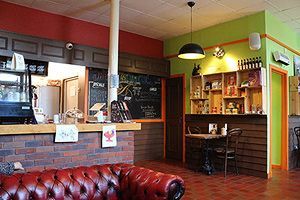 Staking a claim to be Ayr's, and possibly even Ayrshire’s, first dedicated vegetarian café-bistro, the Artisan Lounge appeared in the autumn of 2014. Besides being easy to miss, situated deep in the bowels of a building by the Old Bridge accessed via an innocuous doorway, they’ve nabbed a nice location, with views across the River Ayr from window benches and a small covered outdoor seating area with space for up to 20 covers in summertime. The décor is bright, colourful and simple, and the place buzzes with activity on a busy afternoon, with no table unoccupied for long. The food is all freshly made and offers good choice despite a relatively limited selection, from soup of the day such as minestrone with chunky vegetables to warm specials such as gnocchi with cheese sauce, sandwiches on artisan bread, salads, sharing platters, cakes and bakes. Most of their food is vegan friendly, and they do several gluten-free and other free-from products. Being supplied by the roastery just up the road, the Roundsquare Coffee is a must try.